Rare Investment Opportunity - acquire an income producing duplex in a highly desirable location. Walk to Lake Eola and Thornton Park. 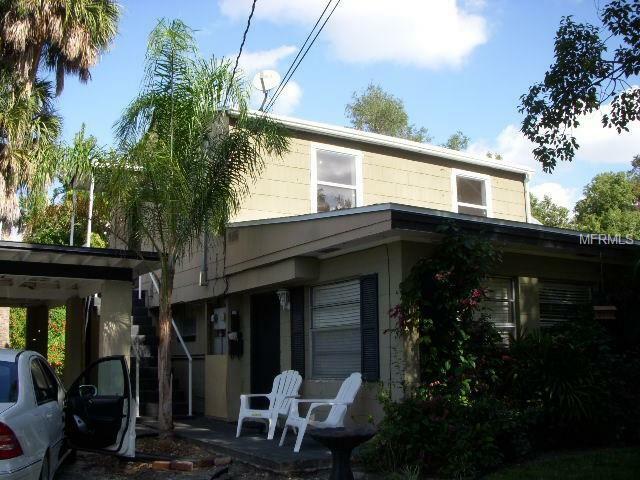 Duplex has 700 SF 1/1 upstairs with hardwood floors. The first floor apartment is a very large (1000sqf) open floor plan one bedroom apartment converted from a two bedroom with central AC The property is currently 100% occupied. Month-to-month leases are in place. Ready for significant increases post renovation needs. Property is priced under appraised value! Apartments are a short stroll to restaurants bars and shopping. Located downtown with easy access to all major highways. The charming brick paved streets will give you a sense of class and tranquility. Use as an investment or build a dream home(s) of your own. Currently zoned as Multifamily R-2B/T/HP. This home is in the heart of the historic district with all it's charm and yet it has been determined by the City that it is a non-contributing structure. Which means you can renovate to your liking or tear it down. House has a rood leak and carport roof needs to be replaced and other updates are needed. It is priced with these issues in mind. Tenant downstairs rental rate is only $995 and this size apartment should rent for around $1500-$2000 in a updated state. The upstairs apartment although not as large as the downstairs is renting for $900 but has no active issues.